Clean. An attractive exterior starts with cleaning and organization. As soon as you’re able, evaluate your rental property’s façade, doors, windows, walkways, lights and landscaping. Discard dead plants or broken branches. Sweep walkways and trim hedges. Then ask yourself: Would getting the windows professionally cleaned create a fresher appearance? Should you sand the peeling front door? Anything that looks messy, dingy or unkempt is a surefire way to turn away potential tenants — so take care of it now. Refresh. After you’ve cleaned debris and messes from your property’s exterior, it’s time to refresh its look. Consider a new coat of paint on the front door and new welcome mats. Plant fresh flowers and/or hang plants around the exterior. While most of these touches are small, they can make a big difference to your property’s overall feel. You may even consider significant additions like a new gazebo or pergola to extend the property’s living space — changes like these not only add value, but may also increase the amount you can get in rent each month. Make Necessary Repairs. It should go without saying that new renters want a property with items that work. If light bulbs are broken, windows are cracked, the driveway is damaged, etc., now is the time to make any and all necessary repairs. Likewise, take a look at the gutters, which tend to endure lot of wear and tear during winter. You may need to clean them or hire professionals to take care of it for you. Consider Curb Appeal. Last, but not least, drive by your property and put yourself in the shoes of a potential renter. Will he or she like what your property offers? Will it be most obvious that someone has taken care of the exterior or that there’s still some kind of eyesore lingering in the yard or parking space? Curb appeal is so important that it can be the thing to attract or turn away a potential renter before you even get a call. Knowing this, re-evaluate everything yourself and maybe even ask a friend to do the same for a fresh perspective. This analysis can help you see spots you’ve missed, additional repairs that need to be made or ideas for adding color and beauty to the exterior appeal. Whether you’re preparing your rental property right now or for later this season, thinking through ways to boost exterior charm is important. 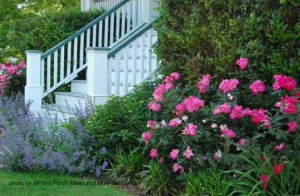 Use the four areas above as a starting point for reviving your property’s front yard, and give potential renters a reason to pay attention to your property. Great tips for prepping the property! Reviving the front yard makes a huge difference on the rental’s curb appeal.